Canning venison is the best way to preserve venison without freezing and makes venison so tender you can cut it with a fork. This process isn't nearly as hard as it sounds. The outcome of the process will be a delicious tasting and tender meal of venison. I usually just pour the jar contents into a saucepan add onions and salt and serve with a baked potatoes. I'm sure many of you will dream up other great recipes with the canned venison. Canning Venison is great for camping, fishing and hunting trips because refrigeration is not needed. 1. 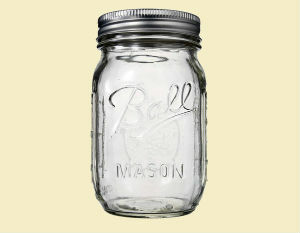 Visually examine the canning jars ( mason jars are very popular ) for nicks, cracks and sharp edges. 2. Wash jars, lids, and bands in hot, soapy water. Rinse. Place lids in a saucepan, cover with water and bring to a simmer(180 degrees). REMOVE FROM HEAT. Leave lids in hot water until ready to use. 3. Place jars in a sauce pot, cover with water and bring to a boil. REMOVE FROM HEAT. Leave jars in hot water until ready to use. 4. Cut the venison into small cubes or chunks. Clean the meat thoroughly and then fill the clean, hot jars with the venison. Don't put juices or water in the jars. Leave about 1" head space between the top of the meat and the top of the jar. 5. Remove air bubbles with a non-metallic spatula. 6. Wipe top edge and threads of jar with a clean, damp cloth. Place lid on jar with sealing compound next to glass. 7. Screw band down evenly and firmly. DO NOT USE EXCESSIVE FORCE. 8. Use a steam pressure canner. Place as many jars of venison as possible into the canner. MAKE SURE JARS ARE SITTING ON TOP OF RACK PROVIDED WITH THE CANNER. This rack keeps the jars from getting too hot. 9. Follow the instructions for the pressure canner. The canner I have holds 7 quarts of meat and it takes 90 minutes at 11 psi. The time starts once 11 psi is obtained. 10. When processed, remove jars from canner. Carefully place jars on a towel or wooden surface out of drafts. DO NOT RE-TIGHTEN BANDS. Let jars cool 12-24 hours. The meat will bubble and boil for at least an hour after you remove them from the canner. Test for a seal. If center of lid is down, jar is sealed. Remove bands if you wish. Wipe jars clean. 11. Store the venison in a cool, dry, dark place. Bands may be reused. LIDS CANNOT BE REUSED. 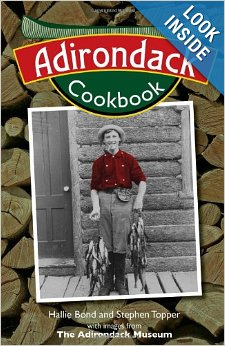 Adirondackers developed a campy regional cuisine that took full advantage of both cultivated and wild foods. These unique recipes for the modern palate are inspired by the foods and foodways of the Adirondacks.